We were in quite a hurry this year to finish the costume, and Steven managed to take this photo despite an earthquake. (No worries, everyone's OK.) We've been so preoccupied that we haven't even carved the pumpkins yet. 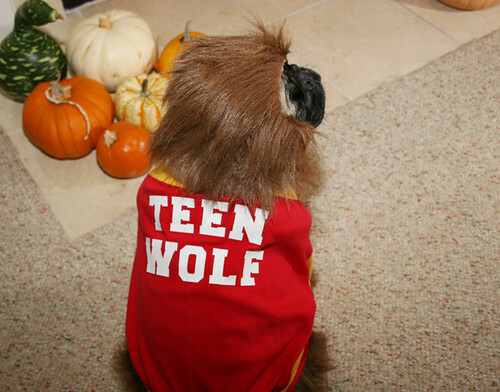 But I couldn't let Shelby's fans down, and not have a Halloween costume this year, so Steven and I proudly present Shelby the Teen Wolf! Shelby received many Cheerios for her efforts, and she's a really patient dog when it comes to fitting and posing. I hope Michael J. Fox would approve. I realized after making the costume, that the mask could easily double as a Dr. Cornelious Planet of the Apes costume. Others have mentioned that Shelby could also be an Ewok. I'll have to keep this pattern in mind for upcoming years. Silly Shelby, you look like a little monkey sitting there. What are you looking at? No seriously, what are you looking at? Fantastic costume! Shelby is such a good sport! High Fives all around! Thanks for not making us a moment longer! We Love You!!!! That's just the funniest thing ever. Too cute! Just adorable!!!!! Love the costume and love Shelby!!!!!! ... you did a great job!!! HAPPY HALLOWEEN!!!! LOVE it!! She really does look like a little howler monkey in one picture. How did you attach the hair around her face?? Shelby! I didn't recognize you at first! You're so cute! 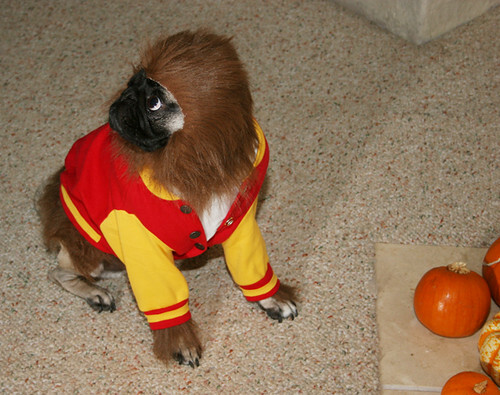 I'm happy my little doggie Mooshie can't see your costume, she would be a jealous pup! Happy Halloween to you and your family! You make the best costumes! Shelby is so cute and looks quite cooperative too. I can't even get a handkerchief on Roy without him sulking, so we don't do costumes anymore. Happy Halloween! She looks really perturbed by the costume to me!!! Oh my gosh! That is so impossibly cute. It even rivals the classic Yoda costume from a couple years back. I can hardly wait to see what you come up with next year. You ROCK!! I love it. you always find the best halloween costumes for shelby! yoda is still my fave but this is still really funny :-) can't wait to see what you come up with for next year. happy halloween! As for the weremask, that's just a modified version of Shelby's Poochador costume from last year. I just made it from craft fur. Ohmygod, seriously. Every year, I watch the Halloween costumes, and every year, I say, "Wow, Winnie will never EVER be able to beat that" Case in point, La Mucha Poochador. I STILL tell people about that. And then. I log on. And there I see TEEN WOLF. And I yelled for my husband to come and see (and he immediately knew who she was supposed to be) and I shook my head in sheer amazement. Oh, Shelby and Winnie. Two gifted, gifted ladies. 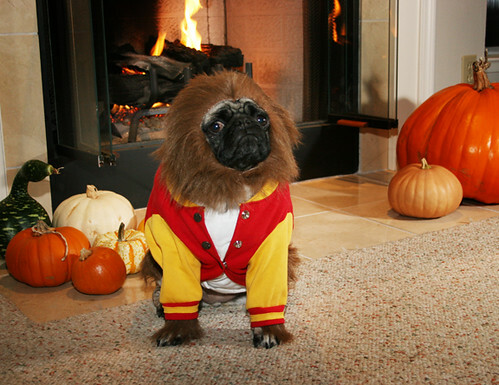 Congrats on the most amazing Halloween costume in Human (Or, Pug) History. You have the most CREATIVE costumes!!... I look forward to what you're gonna do each year... LOVE the Teen Wolf!! Kudos to Winnie and Steven! Your Teen Wolf is adorable-right down to the funny fur piece around her head. She doesn't look too happy for all the cherrios it must have taken... Well Done! She should win every haolloween costume contest. thats the best ever. shes a good sport too about it, letting you dress her. OOOOHHH So awesome!!! I have Shelby's Yoda pic as my wallpaper and didn't realize it was her until a few days ago when I was reading your blog! How awesome is that? Daddy just spit soda across the room. that is the best costume ever. Bravo! What an amazing job you did! Thanks for the smiles today! hahhahah AWWW!!! I LOVE SHELBY!!!! that costume is purely awesome.. as is miss shelby herself!!!! 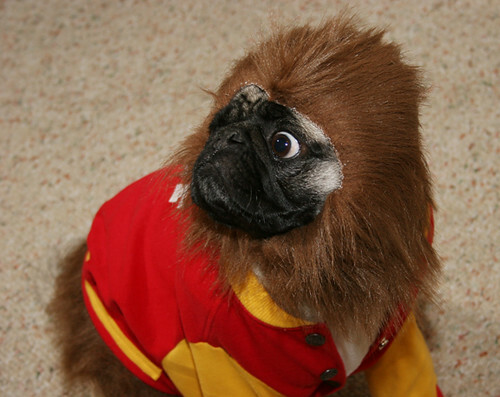 love your blog, love your sense of humor, and most of all, looooove your fantabulous pug! Oh my gosh. I love it! That is the funniest thing ever!!!!! Happy Halloween! I hope you got lots and lots of candy, or, you know, snacky stuff. They did take you trick or treating didn't they? 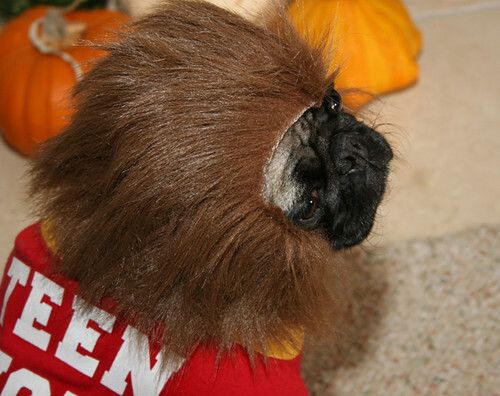 'Owned by pugs' went trick or treating, they got lots of snackies.